10" reverse osmosis filter housing screws. 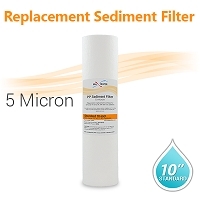 Spun Polypropylene Sediment Filter 10 Micron, size 10"x2.5"
If you purchased an item from another manufacturer or retailer, please refer to their website or contact them directly for technical support. We can only respond to customers who purchased their products from www.maxwaterflow.com. If your inquiry is related to a specific order, please send us a message using the contact form provide your order number in the subject line. Most technical questions about our systems are covered in the FAQS section. If your specific question is not addressed in the FAQSsection, please send us a message using the Contact Form and with the phrase "Technical Support" in the subject.